Panasonic has been rolling out highly competitive widescreen home theater projectors using LCD technology since early 2002. The first models, the PT-AE100, the PT-AE200, and the PT-AE300 were lower resolution products. However, with the introduction of the PT-AE500 in late 2003, resolution was boosted to native 1280x720, and since that time the product line has enjoyed ever increasing market acceptance. Last year's edition, the PT-AE700 hit the ball out of the park with an increase in contrast rating to 2000:1, and the addition of a very long 2.0x zoom lens that made the product usable in a wide variety of room environments. Now comes Panasonic's latest advance in this long line of products, the PT-AE900U. This is basically a refinement of the AE700 that incorporates several new features. The most obvious performance improvement is another boost in contrast to 5500:1. There has also been an increase in average lumen output of about 10%. Changes have been made to the cooling system that reduce audible noise a bit more. The joy stick mechanism for adjusting vertical and horizontal lens shift has been improved for smoother operation. There is a new and more sophisticated menu layout. And a learning remote control has been added as a standard feature. With this remote you can control up to eight devices in the theater room, including not only source equipment, but lights, screens, motor driven drapes, etc. Brightness. There are so many calibration and operational variables on the AE900 that it is impractical to quote actual lumen outputs for each. Depending upon desired settings for screen size and room environment, the AE900 will generate anywhere from 200 to 650 lumens depending on how you wish to operate it. In practical terms, the AE900 is capable of adequately illuminating screens up to 150" diagonal in a dark viewing room. However for best image quality we would limit image size to no more than 120" diagonal. Contrast. The contrast rating of 5500:1 represents another significant boost over the AE700. Panasonic indicates that the dynamic lamp iris and dynamic gamma control are reconfigured on a frame by frame basis every 1/60 second as determined by the average light level in the material being displayed, which by itself is a remarkable achievement that, as far as we know, is unmatched in the industry. The AE900 is able to achieve whiter whites and blacker blacks than the previous model, and the improved dynamic range is obvious in a side by side viewing. Manual zoom and focus. 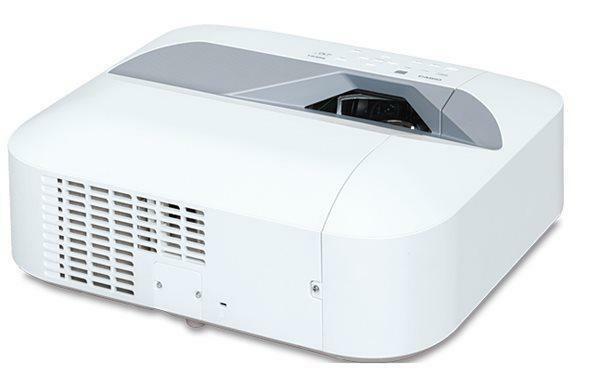 The AE700 was the first home theater projector to offer a 2.0x zoom range on its manual zoom lens, and this has been continued in the AE900. You can get a 100" diagonal image anywhere between 10 and 20 feet throw distance. This is a significant competitive advantage against most other home theater products, because it means that you can set it up in almost any size room without worrying about the cost and inconvenience of ceiling mounting. No matter what your room size, and what size of screen you want, the 2x zoom lens substantially improves the chances that the AE900 can be installed on a shelf or in a bookcase on the rear wall, and give you the image size you want on the opposite wall. Horizontal and vertical lens shift. The AE900 provides the ability to move the lens up and down or to the sides to reposition the projected image on the wall. At neutral position, the centerline of the lens intersects the center of the projected image. From this position, the image can be shifted up or down in a range equal to a little bit more than one full screen height, with a total shift range from one end to the other equaling 2.33 screen heights. Horizontal shift from the neutral position allows for a movement of the image to the right or left in a range equal to about one-fourth of the screen width. Horizontal and vertical movements are not mutually exclusive; shifting the image vertically will restrict the latitude of the horizontal shift, and vice versa. Brightness uniformity. Brightness uniformity on our test sample measured 85% with the lens shift in neutral position, and 80% with the lens in the maximum vertical offshift. Lumen output dropped only 5% from neutral center to maximum offset. So the full range of the lens shift can be used without compromising image integrity. Part of the reason that Panasonic has limited the range of the lens shift is to ensure that image integrity and proper color shading are maintained no matter when the lens shift is set. Six video inputs. The AE900 offers one HDMI port, which means it is compatible with DVI (HDCP) outputs from DVD players or set top boxes that offer DVI output. The connection panel has a PC input (15-pin VGA) for PC, HDTV, and analog RGB video, and two component video inputs (3-RCA) for HDTV and component video. It has an S-video and composite video input, both of which should be used only for VCRs, video game boxes, laser disc players, and any sources for which component outputs are not available. "Smooth Screen" technology. Panasonic has been at the forefront of reducing visible pixelation and the screendoor effect, two problems that have been traditionally regarded as weaknesses in LCD technology. On the AE700 the screendoor effect was eliminated entirely from any normal viewing distance. Pixelation was suppressed to the point that it is not visible except upon close examination of the screen. This has been retained in the AE900, and perhaps even enhanced slightly. As might be expected from the specifications, the AE900 delivers improved performance over the AE700 in black level, contrast, and color saturation. With this release, Panasonic is challenging the 720p single-chip DLP competition head to head on a performance basis rather than just a cost basis. All of the traditional advantages of DLP over LCD--reduced pixelation, better black level, better contrast--have been effectively neutralized with the AE900. Furthermore, color accuracy and saturation, long a latent strength of LCD, is stronger than ever. Though DLP is still capable of generating a blacker black, once having seen the difference between the AE900 and its DLP competitors, we think most buyers would think twice before foregoing the richness of the AE900's color to gain a marginally darker black. We see a slightly softer image on the AE900 than on the AE700. There is no detectable change in pixel structure when examined close up. This is a subtle effect, and would not be noticed except by direct side by side viewing, and then only if you were looking for it. Standing on its own, the AE900 delivers a smooth, filmlike image. Yet we were puzzled by the subtle softness, and were left wishing it were a bit sharper. * Eliminates the $200 cost of a ceiling mount. * Eliminates the cost of long run video cables. * Shorter video cable run ensures maximum signal quality. * Positions the projector in a less visible location. * Eliminates the need to run cables through dry wall. * Easier access for periodic filter cleaning and lamp replacement. * Bookshelf can help to buffer fan noise. * Avoids need for aggressive lens shift or keystone adjustments. All things considered, placing the projector on a rear shelf or bookcase is the easiest and best way to set it up, especially if you are doing it yourself. This design was a key to the AE700's success this past year, and it is duplicated in the AE900. Part of the excitement of front projection home theater is the grand scale image you can achieve at such nominal cost. The AE900 has a street price of about $2,300 at the moment. Yet it can deliver a high quality image of up to 120" diagonal, and even larger depending on how much you want to forego image quality for image size. However, due to the extreme zoom range, it is easy to get a smaller image, such as 70" diagonal, from a workable throw distance as well. When reduced to this size, the AE900 delivers a very bright, high contrast, deeply saturated image that rivals any big screen TV or plasma. So for those who don't really want to go with the huge screen in the home, the AE900 can be a much less expensive alternative to a large plasma TV. It delivers all the space saving features of large scale flatscreen TVs at a fraction of the cost. We would recommend a viewing distance of 1.5 to 1.8 times the horizontal screen width. Though there is no screendoor effect and pixelation is minimized, sitting closer than 1.5x the screen width will make compression artifacts and the digital structure of the image more visible. The eye will resolve the image to a more coherent film-like whole when viewed at a distance of about 1.5 times the screen width. Deinterlacing/scaling. Deinterlacing and scaling is accomplished with proprietary Panasonic video processing electronics. Deinterlacing of standard definition component video is good, and 3:2 pulldown compensation excellent. As with the AE700, picture stability was rock solid when using interlaced input from the DVD player. Results may vary based upon the DVD player you use, so try it both ways and go with the set up that looks the best to you. One of the strengths of the AE900 is its HDTV performance. The 1280x720 panels are made to display HDTV 720p in native format. When feeding the unit a 720p signal, the AE900 produces a brilliant, richly saturated image. Those who are going for the best possible NFL football display will be pleased with what the AE900 can do with football broadcasts coming in on 720p HD signals. Furthermore, HDTV 1080i is remarkably tight on the AE900--the signal was compressed so cleanly into the 720p matrix that it was difficult to tell whether 720p or 1080i was in use. Vertical banding. We saw a total of three AE900s during the course of our review, and none of them manifested any hint of vertical banding. However, that does not mean that every AE900 to be built will be similarly free of it. Quality controls have been tightened significantly by all makers of LCD projectors, and VB is less of a risk than it was before. But on occasion some units may slip through. Make sure to buy from a dealer who has consumer-friendly return policies and a commitment to customer satisfaction. Screen compatibility. The AE900 can be used with good results with either a white or high-contrast gray screen. The choice of screen fabric has more to do with the room than the projector. If your room is a dedicated theater room that you can outfit with dark walls, carpets, ceilings, and so forth (like a commercial theater), then a white screen may be the best choice. If, on the other hand, you are setting up in a living room with white ceiling, light drapes and carpets, etc., then the high contrast gray screen will be the better choice since it will absorb reflected light and give you better black level performance. The Panasonic AE900 is an impressive step beyond last year's AE700. It is a particularly strong solution for users who place a premium on color accuracy. Panasonic has invested a great deal of time and energy into developing projectors that deliver precisely correct color as the film director intended it to be seen, and the results are obvious. With the latest increase in contrast and color saturation, the AE900 represents a significant challenge to competing home theater projectors using the 720p DLP chips. It will be difficult for the more expensive DLP-based products to maintain their current price levels in the face of stiff competition from products like this one. Anyone who is considering a single-chip 720p DLP projector owes it to himself or herself to audition the Panasonic AE900. You will find that the AE900 shines in color accuracy, color saturation, and a smooth, filmlike image that is totally lacking in pixelation. DLP products will certainly hold their own in contrast and black levels, but the overall differences between LCD and DLP are simply not what they used to be. And at street prices in the low $2,000's, there are a lot of reasons for consumers to be giving the Panasonic AE900 a hard look.